Yesterday will be remembered, among other things, as a day that concerned itself with wild things which have been killed and wild things which have been saved. The day started with me glancing through Twitter, as I tend to do on the weekend. There was much talk, still, of Cecil the Lion and of the dentist man who had killed him with his longbow. I knew the story, of course, everybody did, but it had been a busy week and I hadn’t gone any deeper into it than what I was shown. Now, with some downtime in hand, a link to an article beckoned. One click and I was there. And there was the photograph, the one I somehow hadn’t seen during the week. The dentist man, standing over his trophy, grinning broadly, delighted. I had been aware that there was some kind of picture and I had expected to have some kind of emotional reaction to it when I finally saw it. It’s just that I rather expected anger and, instead, what I got was sadness, quite a considerable sadness. My focus did not fall on the grinning man or his compadres. My eyes fell on the Lion, now nothing more than dead meat, stopped, laid low, forever silenced by a single act. I should have been raging but it just seemed so damned sad. I had to go out to do some work and the sadness came along with me for the ride, hovering somewhere over the headrest of my car seat. I was a bit surprised that it did, I try not to dwell on stuff but Cecil did not want to go away. My work took me to a place that was pretty far removed from the ‘beaten track’. An old house, deserted and empty, with no human being for perhaps a mile around. As I walked in the hugely overgrown front garden, I saw a patch of brown colour that didn’t seem to belong, over by the post-and-wire fence. As I came closer, I saw that it was a young wild deer, a fawn, lying dormant on the grass. As I drew closer, I expected to see a carcass, fly-blown and depleted, a victim perhaps of some stray dog. But no, when I got with ten yards, the ‘carcass' shot its head up and regarded me wide frightened eyes. Another few steps and I could see that one of the fawn’s rear legs was seriously entangled in the wire of the fence. It has become wound around tight in the struggle and was biting cruelly into the leg. This animal was going nowhere by itself. I moved in to try to free it and, immediately it started bucking and starting, trying to get away. I worked the wire with my hands, getting nicely kicked in the process but it was all far too tight and too strong. I needed a pair of wire cutters. I hit the car and drove to the nearest farmhouse where a kindly neighbour dug out some tools and drove back with me to help. This man was one of those capable rural men and he had the little deer free in no time. I would have simply let it run away into the wild but the man knew the wild deer herd quite well. He thought the fawn might have some trouble finding them again so he said he would keep it at his house until the herd came across the back fields in the evening and then he would reunite them. That was it really, the photo is of the fawn in the man’s embrace. It seemed quite unstressed, having been released from the painful trap, though if we had released it, it would have doubtless bounded off for the hills. I felt good about all this. It was like some unbelieved-in karmic force had noted my sadness at the senseless loss of one wild life and had then guided me towards an opportunity to save another. If I hadn’t arrived in that overgrown garden yesterday morning, then nobody else would have. I was permitted to be a tiny force of good in the world and it was nice. Later that evening, we rounded off the day with a lovely barbecue with friends. You had a ‘what’? A Barbecue? With meat? Even with my most superficial skim of Social Media after the killing of Cecil, I know that this has been a hot issue with many people. The fact that someone who eats meat can feel pain at the death of the lion and, in my case, feel happiness at the saving of one small creature. I can see why people who feel strongly would feel that way. 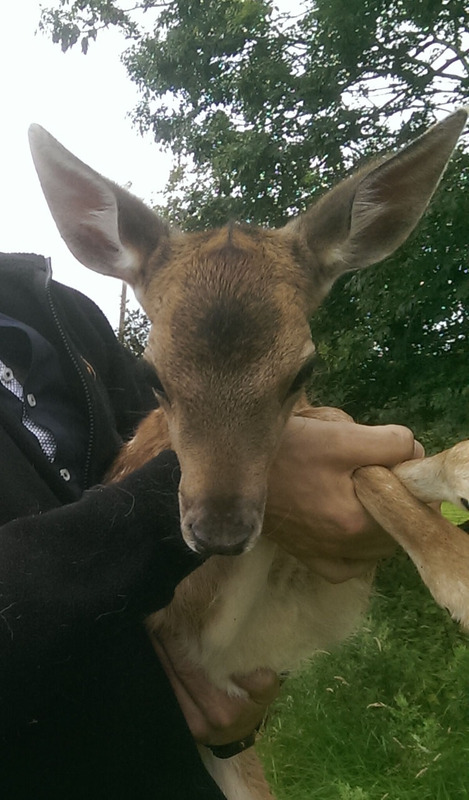 Hark at the eejit, saving the cute Bambi and then running off and eating its mother for his tea. When looked at in that way, it does seem rather embarrassing. But I’m a meat-eater, I always have been. That doesn’t mean I don’t feel. What I think is this. We don’t find our humanity in huge events, we find it in tiny intimate details. When something becomes intimate to us, we can see what kind of a person we are by the way we react to it and by what we do about it. Cecil became intimate to many people for lots of reasons, the celebrity of the lion, the leeriness of the imagery, the availability of a culprit. Similarly, the fawn was intimate to me because, well, it was right there and I was the only one who could do anything for it. What was I to do? Say, “Sorry, I’m a meat eater," and leave it there to die? What kind of a human would I be then? I think we have to embrace any opportunity we get to feel, to really feel something, even if there’s some level of hypocrisy in the feeling, at least it’s human and thoughtful and empathetic. It’s a complicated business. What if had been a rat trapped in that fence rather than a beautiful fawn. Would I have run for the farmer then? Even the people who (not without reason) are baffled by all the meat-eaters who mourned Cecil this week, even they are not immune to the lure of the intimate story. Most of them were not outraged specifically about big game hunting on the day before Cecil was killed. They may well have had a general outrage but not a specific one. It was the intimacy of the story that made them feel the way they did. We shouldn’t fight it. We need to feel, to be made to feel. But we are only human and we simply can’t feel everything for everything. We need to find our tiny little focal points of emotion and feel as much as we can for them. Then, perhaps, we may be doing okay. It’s the whole don’t-kill-something-with-a-name scenario. It wasn’t a lion that was killed; it was Cecil that was killed. The public is a strange beast and choosy. They know wild animals are being hunted for fun—if they don’t then what news channel have they been watching?—and no one got into much of a tizzy but then someone kills an old lion (a lion with his own Wikipedia page) who probably only had another year or two left in him and the lynch mobs are out. So we make an example of the dentist, then what? Then something else new and shiny catches our attention. There are too many deserving causes out there. I had to euthanise my goldfish a while back and that reduced me to tears. I still haven’t replaced him. There’s no way I could kill a lion for sport. I tolerated a spider running about on my bathroom carpet for three days before I could catch him without hurting him and release him outside. I do kill the wee black bugs when I see them and without mercy but then they’re eating my house from under me; that’s different. I am my mother’s son. She loved animals more than humans and with good reason. She wouldn’t watch nature programmes on TV in case she saw some animal being hurt. But, like you and me, she was also a meat eater and her rationale was a simple enough one. “[Y]ou may slaughter your animals in any of your towns and eat as much of the meat as you want” (Deut. 12:15). If God said it was okay to eat meat then it was okay to eat meat and that meant slaughtering livestock which, granted, she wouldn’t have wanted to do herself but she accepted it as a necessary evil. So I never grew up with a meat-is-murder mentality. I’ve lost track of the number of animals I’ve rescued (or at least tried to even if they didn’t want to be or need to be) over the years although never a deer. I’ve had a noisy and destructive cockatiel living in my living room for the last ten years (and knowing the wee bugger he is he’ll last another ten) but what else was I supposed to do? I’m just grateful an injured vulture didn’t turn up on my window ledge but even if it had I’d have done my best. It’s what you do. I’m glad you found the local to help you. I’m always impressed with people who know about Nature and her ways. I can’t hold in my head what side of a tree moss grows on. It is moss, isn’t it? I was talking to someone recently about how much time I spent in the countryside as a kid—a huge amount really—and yet I never learned anything much about it. I couldn’t tell you what flowers you can eat or anything like that. Come the zombie apocalypse I’m stuffed. For the record, if it’d been a rat caught I’d have helped it. When we had mice a few years back. I set humane traps and freed them up the hill but I have to say both Carrie and I were thoroughly entertained by the wee critters running around the house while they were free. Brazen wee things. Had it been rats I would just have got bigger humane traps. just because a friendly cat approached him. God would I love to know who he was... 'Stevie' the cat survived tho, thanks to some intricate surgery involving plates & wires & will soon be allowed back out again, a happier ending than Cecil, but troubling how people think they can visit cruelty on other living beings.